We have over 500 products that are guaranteed to refresh your spring look. We have a gorgeous new spring fragrance for her, a new 2-in-1 wash and shave solution for him and two, and two great beauty bonus offers So without further ado shall we take a peek and learn about all the fabulous newbies that are launched in our gorgeous Oriflame Catalogue 4. 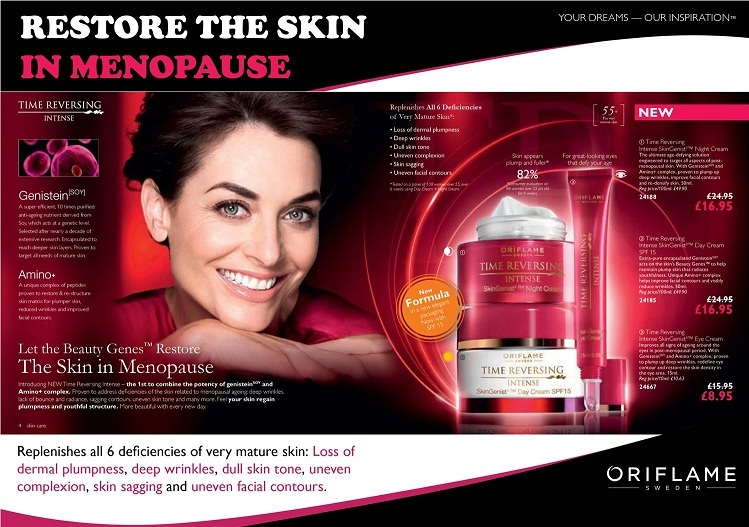 We must start the Catalogue with the launch we’ve all been talking about; Time Reversing Intense SkinGenist, the ultimate age-defying solution engineered to target all aspects of post-menopausal skin. Time Reversing Intense SkinGenist™ combines the potency of GenisteinSOY – Oriflame’s ground-breaking ingredient that stimulates the three core beauty genes – with Amino+ complex to help skin regain plumpness and its youthful structure. During and after menopause, the skin begins to dramatically lose its density, volume and plumpness. This happens because the proteins that make up the supporting structure of the skin, known as collagen and elastin, are compromised. At the same time the skin loses important sugar molecules that attract water and make the skin plump and bouncy. Time Reversing Intense SkinGenist II™ addresses this crucial skin change with the use of Amino+, a peptide-based active that promotes the skin’s primary supporting components and improves and restores skin density. The result is visibly plumper skin with less sagging, reduced wrinkles and improved facial contours. The anti-ageing action of Time Reversing Intense SkinGenist II™ is enhanced with GenisteinSOY, an innovative and revolutionary anti-ageing nutrient originating from natural soy protein, that is the result of 10 years’ intensive research by our leading Oriflame scientists. Time Reversing Intense SkinGenist II™ is further enriched with Rock Rose and Vine Orchid extracts to protect and reinforce the needs of mature skin. It also contains L-Glutamine, an amino acid that acts as cellular ‘fuel’ to help reactivate ageing skin cells. The Revolutionary Time Reversing Intense SkinGenist II range is launched here in Catalogue 4 with the Day, Night and Eye Cream. You can save £23 when buying the set. 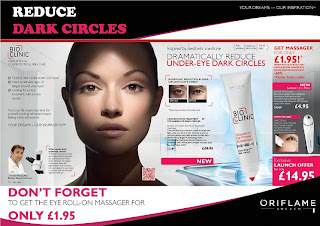 Another newbie in skin Care this Catalogue and a welcomed addition to my BioClinic beauty box is the Circulation Eye Power Accelerator. I haven’t always suffered from dark circles under the eyes but I’m afraid since becoming a mum, I fear these come with the territory. Sleepless nights and juggling family and work have really taken its toll so I was only too happy to put myself forward to trial this and was delighted with the results. The Bioclinic Circulation Accelerator fades the pigmentation and improves microcirculation. It contains Micro-BrightTM with Haloxyl, which is a more concentrated formula than the 'usual‘ eye creams, with more dramatic results. The micro-bright technology fades discoloration, improves microcirculation and illuminates skin, leaving eyes younger-looking and feeling awake. I found it very re-freshing to apply and have noticed in just a few weeks I am using less foundation and concealer under the eye area. It’s definitely minimized the grey complexion and my skin is looking a lot calmer. Try it today and love it forever and get the Eye Roll on Massager for just £1.95 when you by the Bioclinic Circulation Accelerator. Lets learn more about the new Volume Build Mascara with VoluFlex Formula for endless volume building. 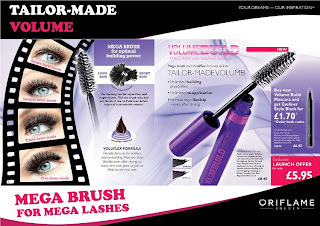 Buildable volume products are relatively new on the market and Oriflame certainly delivers once again with this innovative smudge-free mascara. The buildable volumising mascara allows you to re-apply throughout the day without clumping, flaking or smudging. Every new layer goes on as fresh as the first and there is no limit to getting the thicker, fuller lashes you’re after. 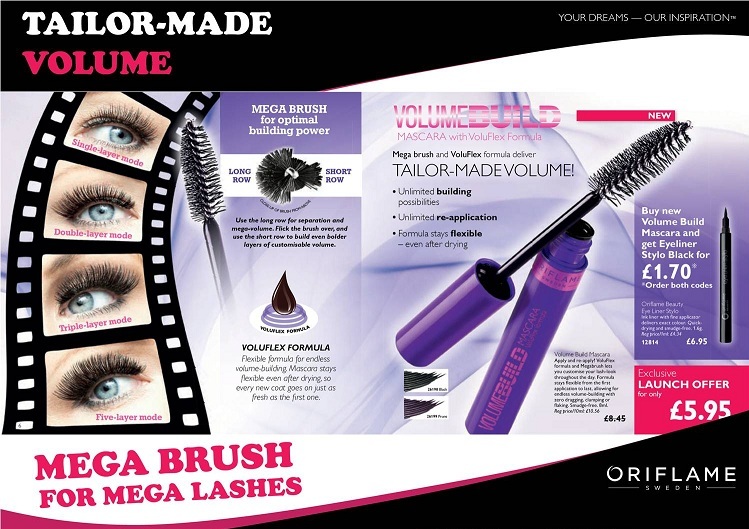 The Mega brush, designed with building power in mind has both long and short bristles. Use the long row for lash separation and mega-volume and the short row to build even bolder layers for customizable volume. Customers can get volumising lashes for only £5.95 and pick up the Eye Liner Stylo for only £1.70 when buying the Volume Build Mascara. The classy eye shadow duo’s come in a new modern design with pearly black case and cream silk-screen with silver foil. The colours, Brown/Beige, Purple/Pink, Grey/Ice have been carefully coordinated to give contrasting colour to highlight and intensify your desired look. They blend beautifully, are easy to wear, long-lasting and contain a crease-resistant formula that feels light on the lids. 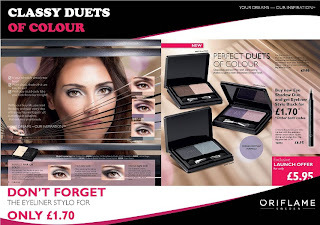 Check out the Catalogue for tips on creating a fresh daytime look or dramatic night look with just one Duo. Like with the Volume Build Mascara, customers can get the fab Eye Liner Stylo at just £1.70 with the any Eye Shadow duo purchase. Now it has been said that diamonds are a girl’s best friend; and now every woman can enjoy dazzling diamonds with our new Giordani Gold Canary Diamond Lipstick. The glamorous lipstick is made with real diamond powder to give your lips sumptuous shine and rejuvenating Italian Acasia honey to help protect against signs of ageing. Your lips will light up the room with this new lavish, must-have lipstick! Our unique formulation will leave your lips in the lap of luxury. Precious diamond powder has been carefully blended with intensive moisturising ingredients to create cashmere like-lips with mesmerizing shimmer that add an extra touch of glamour to every outfit! In addition to the real diamond powder, Oriflame have specially selected Italian Acasia honey from the Italian Mediterranean to boost the lipstick’s extravagant creamy quality. The Italian Acasia honey also encourages the production of new skin cells to help deliver softer, smoother lips and help fight the signs of ageing. Statement nails have taken the catwalks by storm over the past couple of years and there is no limit on colours and styles, everything goes! 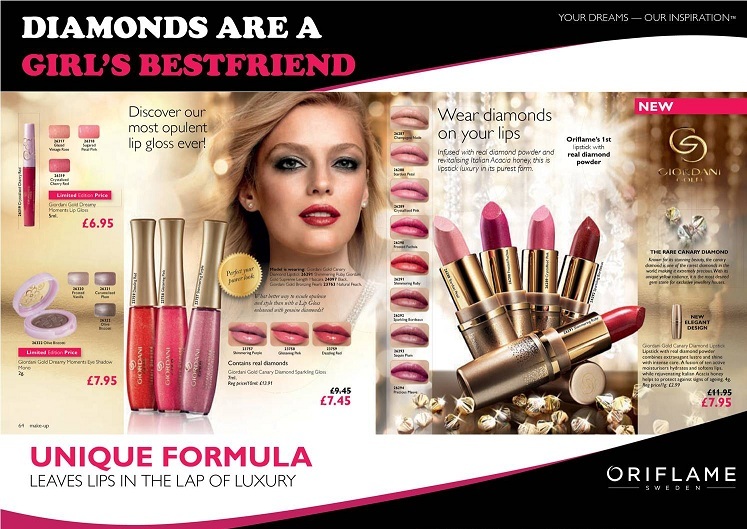 Now our Oriflame customers can get feminine, sultry, soul diva nails thanks to the new nail paints from Very Me. These Nail Paints and Base and Top Coat work in harmony to create the catwalk colour change effect we’ve seen so much of. Simply select your Nail Paint colour of choice and apply 1 or 2 coats to the entire nail, then create a chosen design using the clear Base & Top Coat. As it dries your design is magically revealed. These magic manicured nail paints allow you to be as creative as you want, choose pop-inspired polka dots, fashioned tips, or multicolored madness for nails that get you noticed. These are limited edition and will be very popular so make sure you get your orders in early so you don’t miss out. Now summer is almost on its way and if you’ve got a holiday booked, you’ll be wanting to look your best around by the pool. Next and new into Catalogue 4 we have the Perfect Body Visible Re-Contouring Serum. Oriflame customers can become their own beautician with this innovative product, which targets cellulite in two ways and has its own massager-dispenser. After 4 weeks you will see a significant reduction in the appearance of cellulite and your skin will feel and look smoother. Thanks to Lipo-Slim Complex in the formula, the re-contouring serum helps to prevent the formation of fat cells whilst breaking down existing ones. It also has a stimulatory effect on micro-circulation to help firm and moisturise the skin. The key ingredient Guarana contains about twice the amount of caffeine as coffee beans and caffeine is instrumental in increasing fat breakdown. Inspired by latest advances in packaging technology, the massager-dispenser amplifies the benefits of the gel, helping to improve microcirculation and lymphatic drainage, thus aiding the removal of toxins and waste products which have been linked to skin dullness and the formation of cellulite. It’s the perfect combination of performance product and massager, for all women who want to feel good in their body and show it with pride. Look Good and Feel Good with 35% off in Catalogue 4! Now if you haven’t a holiday booked yet then fear not as Oriflame will help you get a golden sun-kissed body in England! Unfortunately I can’t control the weather but we can give you a glowing hot body to showcase this summer! Say hello to Sun Zone Self-tanning Body Mist and Face Gel. I’m a massive fan of these products and have already been enjoying the compliments as I’ve been applying for the past 2 weeks. It’s just brilliant! It gives a natural-looking and long-lasting streak-free tan in just 3 hours. The formula contains moisturising agents that hydrate the skin leaving it smooth and soft and DHA – a self-tanning agent that builds a beautiful light-bronze tan in just a few hours. It’s been dermatologically tested and the mist sprays onto the body with ease. The Face gel is also easy to apply, don’t be scared, you won’t be orange. It gives only a subtle glow that looks healthy and natural. The Body Self-tanning Mist is a water-based, light-textured formulation in a fine spray that dries in an instant to create an even and natural-looking tan in just 3 hours. And the Face self-tanning Gel is a light-medium tan for the face. Both are on offer in Catalogue 4 with a 30% exclusive launch offer discount! Now for active men who don’t want to waste time we have here a new 2-in-1 product that cleanses the face whilst shaving. 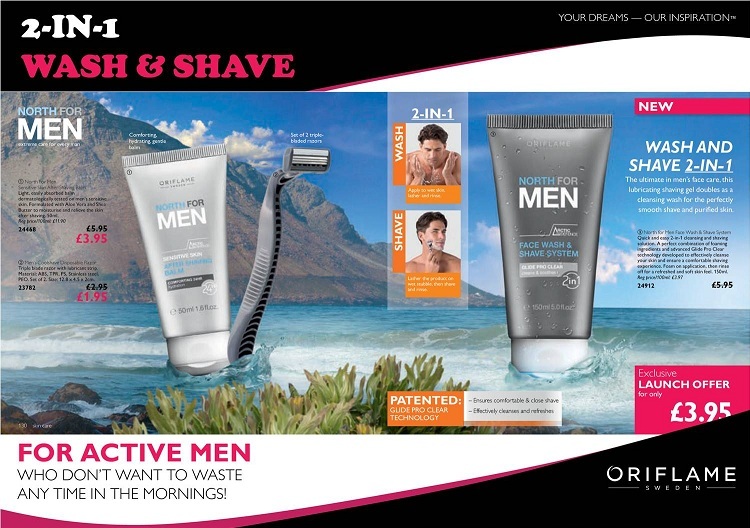 Launched in 4 we welcome the North for Men Face Wash & Shave System. It has an optimised combination of foaming ingredients and gliding agents, to give a comfortable shaving experience and is also suitable as face wash. It cleans the skin, and at the same time, enhances the razor glide for comfort. Proven to lift facial hair, the North For Men Face Wash and Shave System provides a smooth, irritation-free shave. It conditions and cleans the skin while you shave, so a routine task becomes an excellent opportunity for specialised skin care for men. At the start I promised you 2 Beauty Bonus gifts and all our fragrance lovers out there are going to be delighted with this first one. The fragrance is from the woody family. It starts with the delicate and cocooning top notes of chestnut and whipped cream. The ingredients of the dry down – Cedarwood, Peru Balsam and Cocoa essence – generate an intense feminine sensuality. Try the scratch and sniff in the catalogue to reveal a delicate spring cocooning scent with powdery accents. Just beautiful. The second un-missable offer from us this Catalogue is the stunning set of Pure nature Organic Blueberry & Lavender range, found on the inside back cover. Customers can get the set of Calming Face cream, Toner and Face Wash for just £5.95 when buying any other product from Catalogue 4. This is an amazing offer to be had! 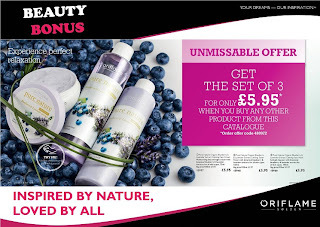 The organic Blueberry & Lavender contains 100% Organic extracts and is for all skin types. Blueberry is a natural antioxidant that helps fight against free radicals. And also has an anti-inflammatory that has soothing and calming properties as well as moisturising effects. The Toner removes remaining impurities and prepares skin for face cream. Face Cream soothes, moisturises and protects. Get all 3 and complete your spring beauty regime for less. 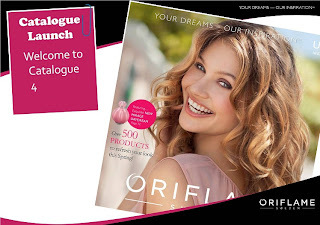 Oriflame catalogue 4 is available to buy from 16th March until the 12th April at www.orijen.co.uk or why not join the national network of consultants and get discount on your products to find out more go to www.orinet.co.uk.